The DTN Ag Confidence Index indicates producer and agribusiness confidence is at an all-time low. Producers and agribusinesses are also pessimistic about the current situation and future expectations. Spring is usually a time for optimism for ag producers as they look forward to another crop, but not this year. Low commodity prices, ongoing high input costs and low income projections have producers feeling more pessimistic about their industry than ever before, according to the latest DTN/The Progressive Farmer Agriculture Confidence Index (ACI). Overall, producer confidence dropped from 92.7 last December to a new record low of 91.5 in March. The value of 100 is considered neutral. Values above 100 indicate optimism, whereas values below signify pessimism. Producers’ attitudes for the present situation remain pessimistic at 94.5, up slightly from 92.2 but down significantly from 109.1 last March. Producer expectations for the future dropped for the second consecutive survey, down from 98.0 last August to 93.1 in December and then to 89.5 in March. The confidence index, which surveyed 500 crop and livestock producers March 1-10, measures the sentiments of crop and livestock producers on their overall agriculture sector impressions. Since 2010, DTN/The Progressive Farmer has conducted the ACI three times a year – before planting, before harvest and after harvest. Producers also rate current and long-term input prices and net farm income to gauge their attitudes toward the present situation and future expectations. In the March survey, 45 percent of farmers described their farm income as bad and 40 percent said income was normal. Micik said this is the second consecutive survey in which more producers considered their current farm income as bad than as normal. “Over the next year, 86 percent of producers surveyed expect farm income will stay the same or get worse. It is also the second highest recorded in ACI history behind only the 88 percent in March 2012,” said Micik. Agribusiness confidence has tumbled dramatically over the past year. According to the latest DTN/The Progressive Farmer Agribusiness Confidence Index, which measured the sentiments of 100 agribusinesses Feb. 29-March 10, agribusiness confidence fell to 83.4 from 98.3. The agribusiness index was in the optimistic range at 104.7 last March. Agribusinesses are also pessimistic about the current situation and expectations for the next year. The rating for agribusinesses’ present situation fell to an all-time low of 88.3 from a near record high of 121.6 in March 2014 and 114.5 last March. “While expectations about future conditions have trended negative the past two years, agribusiness pessimism reached an index low of 79.9 in the latest survey. As a result, agribusinesses have a gloomy outlook about profitability and sales,” explained Micik. 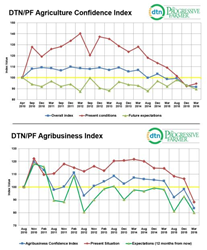 For more on the DTN/The Progressive Farmer Agriculture/Agribusiness Confidence Index, visit DTNProgressiveFarmer.com. Follow DTN/The Progressive Farmer on Twitter at @DTNPF or on Facebook at facebook.com/dtnprogressivefarmer. DTN/The Progressive Farmer is revolutionizing the agriculture industry with its game-changing agricultural information solutions and market intelligence that enable customers to actively and effectively manage their businesses. The company’s insightful, independent content along with proprietary business management tools and in-depth market analysis empower better decision making from today’s forward-looking agricultural producers, agribusiness leaders and commodity market traders. For the latest editorial, weather and market information or more on all DTN/The Progressive Farmer services, visit dtnprogressivefarmer.com. Follow DTN/The Progressive Farmer on Facebook at facebook.com/DTNProgressiveFarmer and on Twitter at @DTNPF.